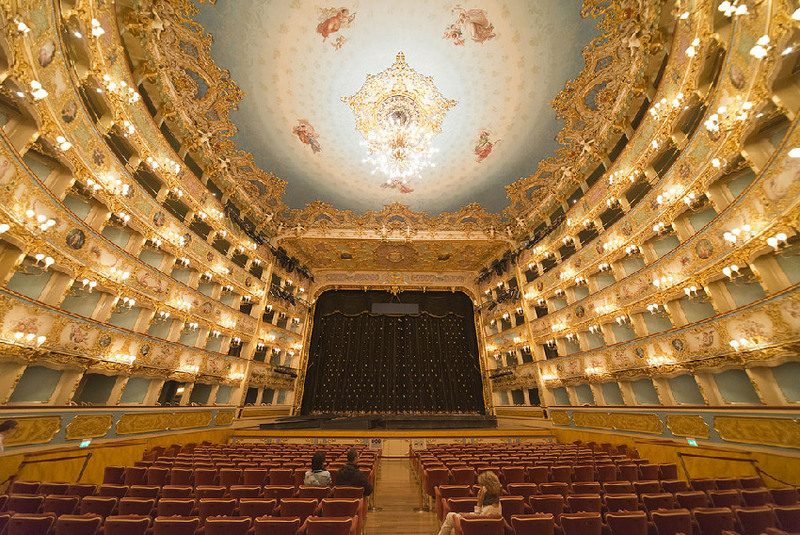 Italy has many beautiful, historic opera houses, most of all still serving as theatres. Opera and ballet fans should visit at least one opera house and enjoy a live performance in one of this theatres in Italy. The opera season is generally from October to March or April but outdoor performances are held in the summer. There are various beautiful and famous opera houses and theatres in Italy. We just want to suggest the unmissable ones. That places you should see at least once in your life. Especially if you are an Opera-lover. It is one of the symbols of Milan, famous all over the world for its great prestige in the artistic field: we are talking about the Teatro alla Scala, located in the homonymous square of the city. The history of this important theater “begins” with a fire: towards the end of the 1700s the Ducal Theater took fire and in its place the sovereign Maria Teresa of Austria had a new structure built, commissioning the work to the architect Giuseppe Piermarini. On 3 August 1778, this gem of neoclassical art was officially inaugurated and for the occasion “L’Europa Riconosciuta”,a piece especially composed by Antonio Salieri, was staged. 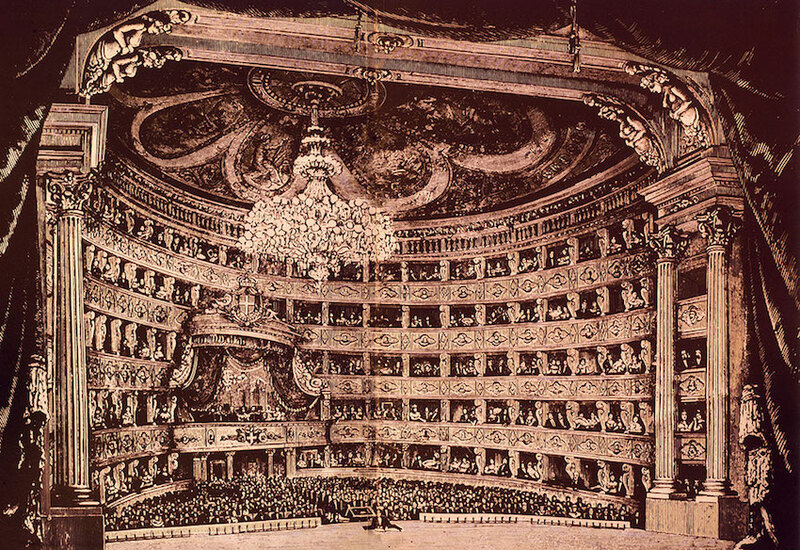 Over time La Scala of Milan underwent some architectural changes: Napoleon abolished the royal box, in 1807 stuccoes and valuable decorations were added, and in 1813 more space was given to the stage. During World War II it was bombed out and then rebuilt. Successively it underwent an extensive and controversial renovation in 2004. Rossini, Donizetti, Toscanini, and Verdi are just some of the great composers who have enchanted the audience here with their compositions. If you want to retrace the history of this incredible theater, we are waiting to accompany you on an exclusive six-day tour of Milan, Venice and Rome: a unique opportunity to admire one of the most beautiful Italian theaters. Although the greatest artists of classical music have taken this stage, the Teatro alla Scala was not intended only for artistic representations: the space was also used as a ballroom. It was not rare that noble families entertained their guests in the boxes, and they even enjoyed gambling there. La Scala in Milan is a place full of charm, thanks to the splendid architecture that characterizes it. But what are the curious facts related to one of the most famous theaters in Italy? Not everyone knows that in the past the seats of the stalls could be removed to create a free space where the public could be entertained by dancing, or even riding on horseback! The stalls of the Teatro alla Scala conceal a curious story: each one was decorated by the family who owned it; the more the box was ornamented the more rich and influential was the family that it housed. Stall number 13 hides yet another secret: it is entirely covered with mirrors, a sly way to get to see and spy on every corner of the theater. From the boxes to the ghosts: the Teatro alla Scala “hosts” the spirits of the great artists who have walked the stage; it is said that even the ghost of the great soprano Maria Callas has manifested itself! To date, La Scala continues to draw the top voices and orchestras to perform on its stage. The season opening at La Scala in Milan is one of the most anticipated social events of the city. Now we find ourselves in one of the most suggestive cities in Italy: In Venice, precisely in the Sestiere di San Marco, stands the beautiful and famous Italian theatre Gran Teatro La Fenice. Its history dates back to 1792: the Venetian theater was realized by Antonio Selva following the destruction of the Teatro di San Benedetto. This masterpiece of neoclassical refinement soon became one of the most beautiful and admired theaters in Italy: its official inauguration was on May 16 with the staging of the play “I giuochi d’Agrigento” by Giovanni Paisiello. Then, the history of the Gran Teatro La Fenice was marked by a sad fate: in 1836 a fire almost completely destroyed the building, which was rebuilt immediately by the engineers Tommaso and Giovan Battista Meduna who brought it back to its former glory. Unfortunately, another devastating fire destroyed the Grand Theater, this time in 1996. But just like a phoenix (the mythological animal of which the theater bears the name) the theater “rose from its ashes” returning to shine in all its elegant beauty. The reconstruction of the theater was meticulously done, recovering the magnificence of the past: thanks to the work of expert artisans it was possible to decorate the Grand Theater La Fenice with stuccoes and precious golden details, just like in 1700. The Grand Theater La Fenice in Venice has hosted performances of operas by authors who have marked history: the music of Gioacchino Vincenzo Bellini, Rossini and Giuseppe Verdi has enchanted the audience of the hall with their beauty. Today it is a landmark on the world opera scene, home to more than a hundred opera performances a year, an extraordinary season superbly directed by well-known artistic directors. The Teatro San Carlo is the oldest continuously active venue for opera in Europe and one of the best known theatres in Italy. Naples’ Teatro San Carlo was founded in 1737. Some of the first ballet productions were performed here. It is the oldest opera house in Italy and with over 3000 seats, this theatre was home to several icons of Italian classical music and opera. 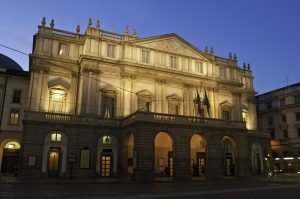 Opera, ballet, and classical music are still performed at Teatro San Carlo. A symbol of the cultural greatness of Naples so strongly desired by Charles of Bourbon, it was designed by Giovanni Antonio Medrano and Angelo Casarale. With 184 boxes arranged on six floors and 1379 seats, the Teatro San Carlo is the largest theater in Italy. There is also a museum in the planning stage. The sumptuous and elegant furnishings and the beautiful decorations are just some of the amazing features that will strike you immediately: you should also know that the Teatro San Carlo was the first to introduce the horseshoe floor plan, one of the principal stylistic elements of the Italian style theater. The theater has undergone several renovations. 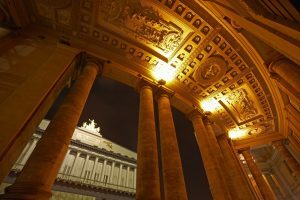 The architect Antonio Niccolini created the striking neoclassical façade and placed the three statues of the “Triade della Partenope” on the pediment. Unfortunately, the disastrous fire of 1816 completely destroyed the building, but Emperor Ferdinand IV wanted it rebuilt in just 10 months: the result is the splendid architecture that you can admire today. The most recent touch was given in 2009 by Elisabetta Fabbri who created the new foyer. One of the particularities of this historic theater is the perfect acoustics, ingeniously obtained thanks to the lifting of the ceiling by the architect Niccolini. The Teatro San Carlo, just like the city of Naples, hides mysteries and legends. Did you know that the theater and the Royal Palace are connected by a secret passage? It was built at the behest of the king who wanted to go to the shows without having to go out into the street and be seen by his subjects. In the side walls of the royal box, there are inclined mirrors that allowed the public to observe the king: it was an unwritten rule, in fact, that no one could applaud or ask for an encore before the sovereign did so. Not everyone knows that originally the upholstery of the Teatro San Carlo was blue and not red: the blue of the house of Bourbon was replaced after the unification of Italy when it was decided to use red, a typical color for theaters of the period. There is another San Carlo Theater, very similar to the Neapolitan theater: the architect Josè da Costa e Silva designed the Teatro Nacional de Sao Carlos in Lisbon, using the stylistic elements of Neapolitan architecture. San Carlo’s “orchestra tours” are very famous and expanded the theatre’s prestige throughout the world. Also note that the Teatro San Carlo is home to one of the foremost ballet academies in the world, and that here ballet performances as well as operas are often held. With our exclusive 8 days tour in Naples and Amalfi coast, we will bring you to visit one of the most prestigious theatres in Italy. Teatro Massimo in Palermo is the foremost opera house in Sicily and the third largest opera house in Europe, as well as one of the finest of the entire continent. Its acoustics are some of the best in the world. The domed building is considered an architectural milestone and was featured in Francis Ford Coppola’s Godfather (III). Performances hosted all year-round include opera, ballet, and music. A must-visit for music fans, opera lovers and architecture passionates. The Teatro Regio in Turin is another prominent opera house in Italy restored after being burned. The original 19th century theater was destroyed by fire in 1936. This theatre is home to musicals, plays, ballet and opera. Originally built as the royal theater in 1740, this opera house in Piazza Castello – a beautiful square in Torino – seated many international important persons, including Napoleon. An amazing outdoor venue to watch performances, with a great acoustics (live shows are often performed without microphones). Fundamentally, the Arena di Verona is a restored Roman amphitheater just like the Colosseum in the middle of Verona. It was built in the 1st century AD. under the guidance of Emperor Augustus. Just like the Colosseum, the Verona Arena was also home to the games of gladiators that entertained the inhabitants of the city. The Veronese amphitheater has changed its function several times throughout its history: in the medieval period, it was used as a place for public executions, while in the 1600s it hosted various spectacles, even the running of the bulls. 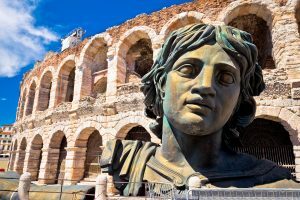 The Verona Arena began to approach the opera in the 1800s, laying the foundation for its history of extraordinary successes. For over a century this incredible open-air theater has regularly hosted over twenty thousand spectators on its impressive steps who flock from all over the world to attend the grand opera season on its stage. Each theater has a suggestive story to tell. The story of the Verona Arena is linked to the myth of its foundation. Legend has it that a Veronese gentleman was accused of a serious crime and in order to save his life, he promised the citizens that he would build a theater for Verona. In order to succeed in this plan, the man sold his soul to the devil who, in the night, sent his demons to build the great work. The gentleman, repentant of his actions, begged the Virgin Mary to free him from the darkness. The theater was almost finished, but the devils fled, leaving the theatre incomplete, with the characteristic shape that we can admire today. Unlike other opera houses – due to its outdoor setting – the opera calendar for the Arena is during the summer. This open-air venue does host also other outdoor concerts (pop music and not only that) during the rest of the year. It’s time to leave for an exclusive tour to discover Verona and its magical places: leave it up to us to help you discover the most fascinating and curious aspects of this romantic city.